As mentioned earlier, services and daemons are processes that run in the background. Websites work through services known as web servers, which listen for and respond to requests on ports 80 (port 443 for websites that support encryption). For instance, if you want to go to google.com, your computer will send a request to Google’s servers for the contents of google.com. When your request arrives at Google’s servers, it’s directed to the process listening on port 80. This process – the web server – interprets the incoming request and responds with the information your browser needs in order to display google.com. We’re going to host our own websites using a popular web server called Apache. Apache is one of several components of what is known as the LAMP stack: a bundle of programs and services designed for quick and easy web hosting. 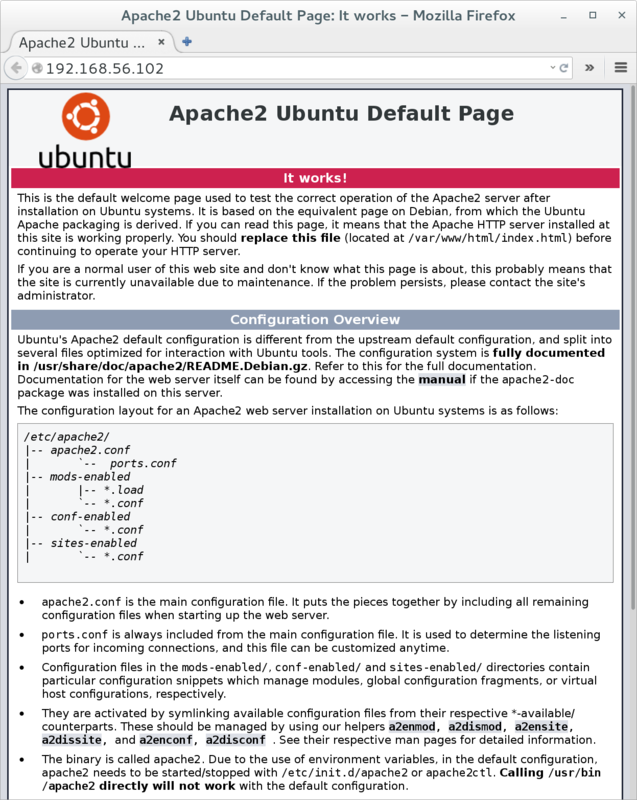 The first two letters – Linux and Apache – we’re already familiar with. The M stands for MySQL, which is a database management system, and the P stands for PHP, which is a programming language for creating dynamic scripted websites. We won’t deal with MySQL or PHP directly during this guide, but for more information you can visit MySQL’s official website and PHP’s official website. Notice the carat at the end ; this allows apt-get to take the place of another program known as tasksel. Tasksel is a program for easily installing software bundles such as LAMP. 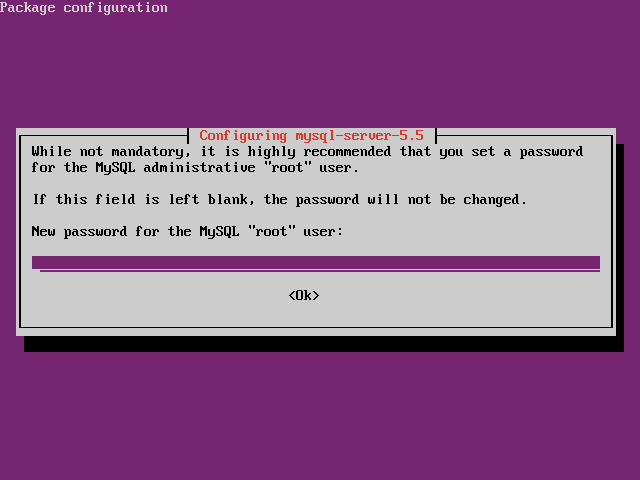 During the installation process, you might be prompted for a password for MySQL’s root user. It’s ok to leave this blank; we won’t need it during this guide. Once the installation is done, you’re ready to go! Test out your new web server by opening a web browser and navigating to “http://<server’s internal IP address>.” If all goes well, you should see the following page. 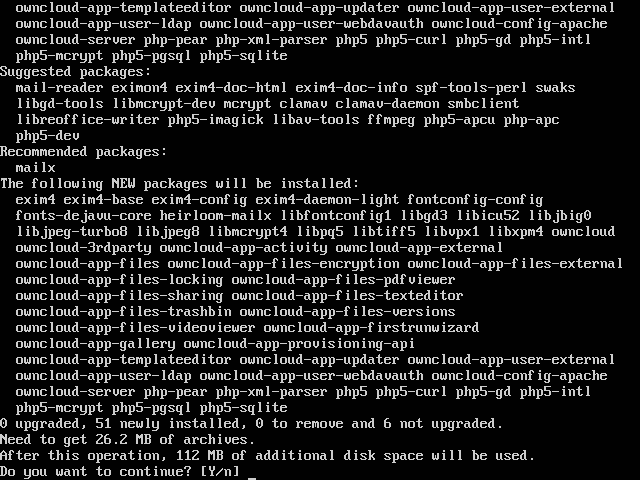 I picked ownCloud for this guide because it provides a comprehensive feature set in a package that’s easy to install and maintain. ownCloud combines file synchronization, calendar and contact management, online document editing, and dozens of other features. It provides many of the features you’d expect from a professional cloud service, completely free of charge. For a full overview of ownCloud’s features, visit owncloud.org. Once that’s done, try navigating to “http://<server internal IP address>/owncloud.” If all went well, you should be able to set up ownCloud and create an account. If you see the following error, it means your web server doesn’t have access to a certain directory. The problem relates to the previous section on root and user permissions and is discussed in the next section, Restricted Users. During installation, many services add their own separate users to your system. For instance, Apache adds the www-data user. You can’t log in as www-data over SSH, and www-data doesn’t have a folder under /home. The reason www-data exists is to prevent Apache from running as an existing user and gaining permissions, such as your user or even root. Imagine if Apache ran with your user’s permissions: there’s the chance that a malicious user could manipulate Apache into accessing your documents or even running sudo. To prevent this, services create new users that only have the permissions needed to effectively run the service. Then run the following two commands to grant www-data the right permissions. The first command runs chown, which changes the owner of the file or directory specified. The -R parameter tells chown that this change should be applied recursively to each file and folder underneath the provided folder. The second command runs chmod, which changes the mode (permission set) of the file. The g+rw parameter tells chmod that we want to add read and write permissions for the group that owns this file (the www-data user is also part of the www-data group) recursively. With these commands executed, switch back to your web browser and refresh the page. 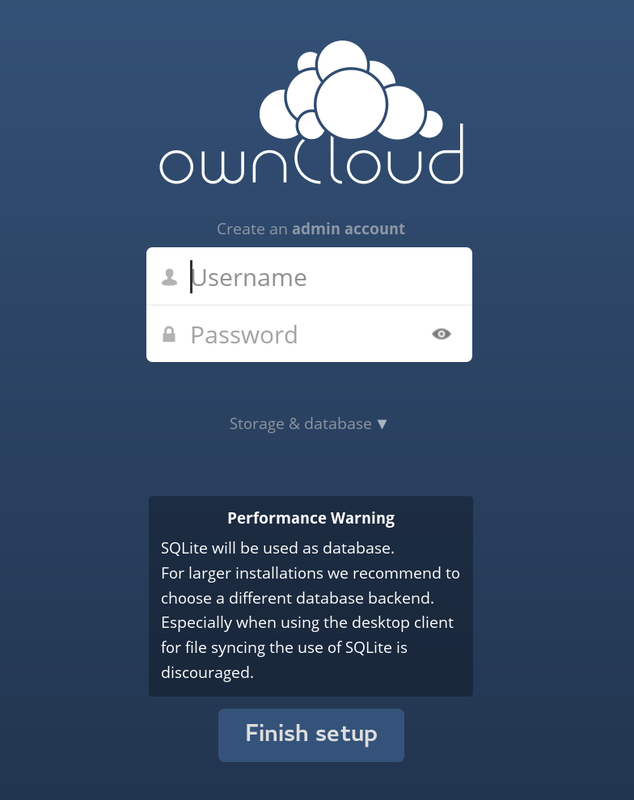 When you’re able to open ownCloud’s setup page, it should ask you to create an admin account. You can also specify where to save ownCloud’s data. This defaults to /var/www/owncloud/data, but you can choose to store it in another location such as an external drive or even on another computer. There are a lot of features to ownCloud, and the best way to familiarize yourself with them is to jump right in and start using it. ownCloud’s website provides an in-depth manual for getting started with the latest version of ownCloud. There are plenty of personal music streaming options available including Plex, Serviio, and PS3 Media Player, but Subsonic has consistently remained one of my favorites. Once you’ve installed Subsonic, you’ll be able to manage and stream all of your music from anywhere in the world. Subsonic provides a basic free version with a premium subscription option. The premium option adds support for apps, video streaming, podcast support and others. A subscription costs $1 a month, although there is an evaluation period of 30 days. While I encourage anyone who enjoys using Subsonic to support the developer and buy a subscription, I understand that it’s not always possible. There are variations (forks) of Subsonic that remove the licensing model entirely, but finding those forks will be left up to you. 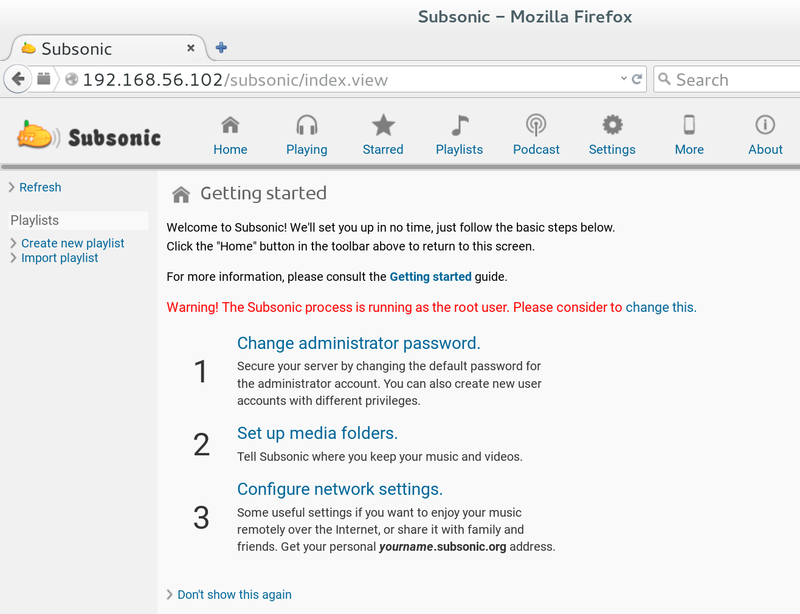 Unlike ownCloud, Subsonic doesn’t use Apache to host its webpages. Instead, it comes bundled with its own web server. However, since port 80, the traditional port for web servers, is being used by Apache, Subsonic defaults to port 4040 instead. Instead of having to open a new port, you can take a somewhat sneakier approach by forwarding requests to Subsonic through Apache. 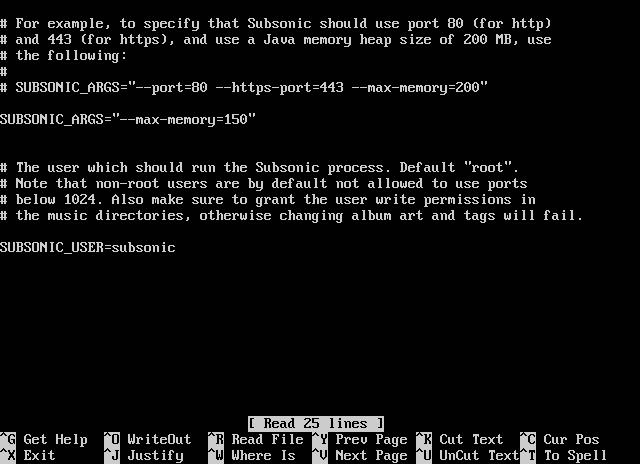 This way, it will appear as if Subsonic is being hosted on port 80 even though it’s actually on port 4040. Scroll down (or search) until you reach the end of the file (after the last IncludeOptional directive and before the line that starts with “# vim”). We’ll add our proxy rules here. Whoa, hang on, what just happened? First, we disabled ProxyRequests. ProxyRequests makes it appear as though requests going to the Internet from the internal network are coming from the proxy server. This may seem innocuous, but imagine if an attacker was able to masquerade his connections to appear as if they were coming from your server. We only need the proxy server to masquerade internal connections, so we’ll disable ProxyRequests. ProxyPreserveHost will prevent some headaches when dealing with domain names later on. For now, it lets us ensure that Subsonic doesn’t confuse its own web server’s IP address (which is running on a special address known as localhost) with your server’s IP address. The next four lines determine who has access to our proxy. We’ll allow anyone with access to the server to access the proxy. If you only want specific IP addresses to access the proxy – such as the local network – you can configure those restrictions here. The final two lines define exactly how Subsonic is proxied. A normal URL is split into multiple components: the protocol used (e.g. http://), the host (e.g. google.com), and the full path to the resource (e.g. /mail). We’re telling Apache to create a /subsonic resource, then shuttle requests from that resource to the Subsonic server. You’ll see how this works shortly. Once this is done, use the reload parameter to refresh Apache’s configuration without shutting down the web server. One final action: we need to change Subsonic’s configuration so that it’s aware of the /subsonic resource. 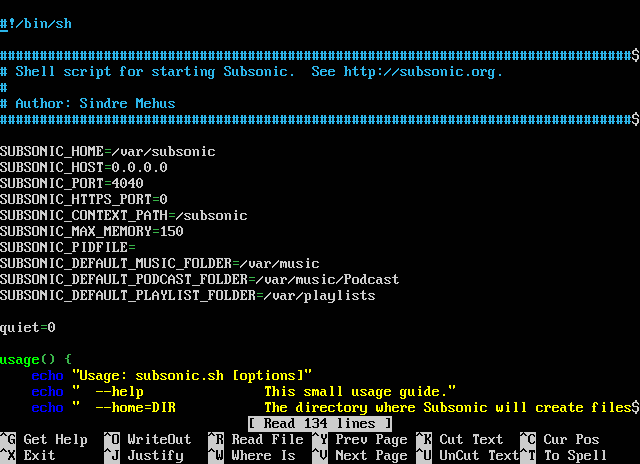 You can find Subsonic’s configuration file at /usr/share/subsonic/subsonic.sh. Remember all that fire and brimstone about the root user? Unfortunately Subsonic is a prime example of that: by default, the Subsonic process runs as root. To fix this, we’ll create a brand new subsonic user that only has access to the subsonic process and media directories. To start, we’ll use the useradd command to create a subsonic user. The -r parameter specifies a system account, making it impossible to log in as the subsonic user. The -U parameter creates a corresponding subsonic group, of which the subsonic user is a member by default. The subsonic group lets you distribute a single permission set across multiple users. For instance, if you want to be able to directly modify folders owned by Subsonic, you can add your current user to the Subsonic group. This makes it possible to upload media directly to your server instead of through Subsonic’s web interface. Finally, let’s tell Subsonic to run as the subsonic user instead of root. Open /etc/default/subsonic in your text editor and change the SUBSONIC_USER line from root to subsonic.